There were some major forecast changes for Hurricane Florence over the past 24 hours, and the latest projections show the storm making its way through the Upstate. 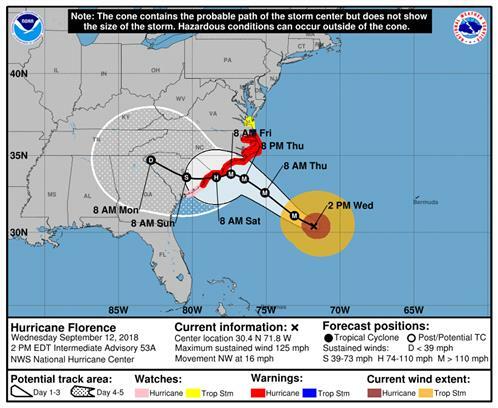 Nearly every update has had some kind of trajectory change, so please make sure you are viewing the most recent instructions and advisories coming from the South Carolina Emergency Management Division. Below is a copy of the storm projections as of 2PM on 9/12/18. I've been receiving various updates from state and federal agencies, and I will be passing along as much relevant information as I can. On September 10, 2018, President Trump declared an emergency for the state of South Carolina at the request of Governor Henry McMaster. The Federal Emergency Management Agency (FEMA) is authorized to provide emergency protective measures, limited to direct federal assistance, under the Public Assistance Program at 75 percent federal funding to support the state for all 46 South Carolina counties, in preparation for Hurricane Florence. FEMA currently has two Mobile Emergency Response Support units in South Carolina to assist the state with secure and non-secure voice, video, and information services to support emergency response communications needs. Additionally, the Trump Administration has temporarily relaxed certain trucking and energy related regulations to help minimize fuel and electricity shortages. If you have friends and family who live in an evacuation zone, encourage them to leave NOW. The window for safely evacuating is quickly closing. On Tuesday, there were 1,600 residents in the Carolinas who spent the night in an emergency shelter, with that number expected to rise significantly as the storm approaches. If you think there's any possibility you may need to stay at an emergency shelter, make sure to locate one ahead of time, particularly if you are traveling with pets because only certain facilities have the ability to accommodate them. You can find a list of shelters HERE. Utility companies are expecting anywhere between 1 to 3 million power outages as a result of the hurricane. So far, over 10,000 extra utility workers have been brought in from out of state and are on standby to restore power as quickly as possible. However, with that many outages expected, it is vital that you prepare for the possibility of being without power for several days. Power outage preparedness tips can be found HERE. Another concern for the Upstate is flooding. Somewhere between 2-6 inches of rain are currently expected to fall in the upper part of the Third Congressional District over the weekend. It is important to not walk, swim, or drive through flood waters. Remember that just six inches of moving water can knock you down, and one foot of moving water can sweep your vehicle away. Do you have a family emergency disaster plan? If not, here’s what you need to know to put one together. Please reach out to my office if you have any questions or if I can be of assistance. Stay safe!